Happy Bays, that peaceful little town nestled on Long Island’s south shore, is suddenly the scene of a brutal murder. Felicity Bell, baker and sometime crime reporter, decides to get involved when the police appear stumped. 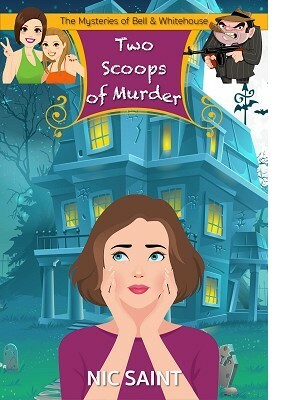 Very soon, however, more murders startle the small community, and Felicity enlists the help of the ‘holy trinity’, three nosy and gossipy members of the Happy Bays Neighborhood Watch Committee (HBNWC). Meanwhile Alice Whitehouse, Felicity’s best friend and chairwoman of the HBNWC, has other fish to fry in the form of Reece Hudson, Hollywood hunk. Alice has been Reece’s number one fan since he first rose to fame, and the fact that the handsome movie star is in town to introduce his fiancée to his father doesn’t stop her from accidentally falling into the man’s arms, and promptly signing him up for the HBNWC. Now Felicity, with the help of Alice, the Holy Trinity, and action hero Reece Hudson, has to find a way to stop the killer before he strikes again. And as the body count rises, Felicity finds herself running out of time, out of options, and out of customers.